I ACT LIKE I’M a woman who knows about beer when really I just pick the most interesting labels. 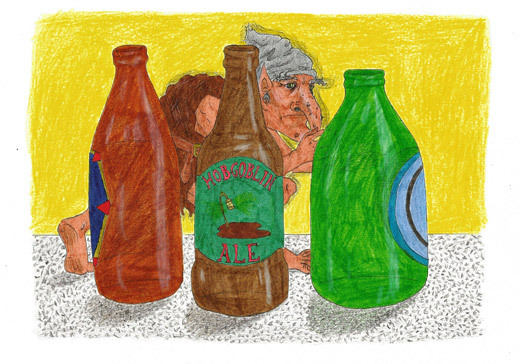 I’ve coughed down syrupy lagers and thin ales, savoured rich stouts and sharp sours, all while admiring their bold bottles—sea serpents, naked goddesses, rampant lions, fat kings, tattooed bikers, garden gnomes! But the trouble started when I picked the one with the hobgoblin on the label. After drinking, I recycled the bottle, as I always do, but somehow the hobgoblin made it off the label and into my apartment. It was a bad time for it. I was tired of my job, low on money, low on spirit, and it had rained for fifteen days straight. My friends were busy and boring, my family was on the other side of the country, and I’d given up on romance three months earlier when my last date had told me I should dress like I cared more and talk like I cared less. The only thing I was putting any effort into was keeping the apartment looking nice, because I was spending a lot of time in it. I developed a big interest in quality cleaning supplies and lifestyle television shows. I told myself that I could be a good wife one day. It wasn’t about dressing or talking any differently, like that jerk had said over glasses of tart wine. It was about knowing how to look after yourself and your things, being an interesting and kind person, and having an enthusiasm for beer, if not just the labels. I could definitely be a good wife one day, I told myself as I headed out one drizzly Saturday to buy beer and bleach. The beer was the one with the hobgoblin on the label. It was a dark ale that clashed with the curry I made for dinner, but I drank it quickly and enjoyed it enough. When I was finished, I tidied the kitchen, took the recycling (including the bottle) outside to the curb, and called it an early night. When I woke up the next morning, I was aware of a certain strangeness in the apartment. The air seemed thick, alive, like when you’ve left the television on a static channel. Sunlight streamed in through the large window opposite my bed, which struck me as irregular. I always kept the curtains tightly drawn, yet there they were, pulled to the side, beckoning in the morning flame. I then heard shuffling by my desk and thought, rats, roaches, but was quickly proven wrong, for there emerged the hobgoblin from behind a nest of papers. It was a foot tall and looked just like the character from the bottle. I would liken it to an overgrown potato with humanoid features: a hooked warty nose, large feet, strangely muscular arms and sharp ears. It wore a brown sack-shaped garment drawn in at the waist with a belt, and shifty eyes peered out from under a grey cap. Its eyebrows were alarming. “Excuse me,” I said. The hobgoblin gave a small hiss, and gestured a knobby finger to the nest of papers. I should note that my desk was probably the least tidy spot in the whole apartment; I neglected it, because it reminded me of work. I watched, bed sheets pulled up to my chin, as the creature organised the disarray into a neat stack and placed it in a drawer, which it needed to use both hands to open. It let out a gurgled sigh, and then got to work on the rest of the mess strewn across the desk. As it was distracted with a case full of mismatched pens and lids, I quickly got dressed and exited the apartment for a long walk. I’m not sure what I expected upon my return an hour later, but the hobgoblin was still there, sweeping the kitchen floor with a broomstick three times its size. It used a manoeuvre that involved holding the stick up high and hopping across the tiles, whilst dragging the straw sharply through the dust. The floor had a bright sheen that I never seemed to manage and I suspected enchantment, which was a suspicion I rarely had cause to have. I mumbled a ‘thankyou’ to the goblin as hung up my jacket, and he gave a little hiss back. I placed the remainder of a bagel I had bought on the counter while I used the bathroom. When I came back, the bagel was gone and the goblin was hissing considerably less. We spent the day dancing around each other. I had a small amount of work to do, websites to browse, things to read, and the hobgoblin kept finding things to tidy, even though I had thought I was so on top of it. It scrubbed at lampshades and organised cutlery, straightened carpet tassels and shined doorknobs. Come evening, I decided to head out for some drinks with friends I hadn’t seen in a long time, who sounded astonished over the phone when I expressed interest in meeting up. I left the hobgoblin dusting the coat hangers. I went out and got drunk. I didn’t feel like beer, so I ordered cocktail after cocktail: gin, vodka, rum, schnapps; sweet, bitter, tangy, creamy. The friends seemed to like me more with every sip and I wondered why I spent so much time at home, cleaning and thinking, thinking and cleaning—and now I have a hobgoblin, can you guys believe it? The friends laughed and thought I was funny; one of them paid for my taxi home. I couldn’t have said whether the goblin was there or not when I walked through the door that evening. I was so inebriated that could have stepped on him for all I could comprehend, squashing his warty potato body under my boot, tearing his little cap with my heel. All I knew was that when I awoke in the morning, dizzy and throbbing, the hobgoblin was gone. And so were the curtains. The curtains had been taken, leaving the big window naked and glaring. Sunlight spilled in: a bold visitor, patting me on the head and roaring good morning. I sank back into the pillows with a small sigh that sounded almost like a hiss. Fine then, I thought, let the light intrude today. KAHLI SCOTT is a Brisbane-based writer. She studied creative writing at Queensland University of Technology, and was the recipient of the 2013 State Library of Queensland Young Writers Award. She is currently curating a flash fiction collection with local publisher Tiny Owl Workshop. You can follow her @KahliScott.